I found the most incredible prints a while back based on original Famille Summerbelle hand paper cut outs (HAND CUT!). 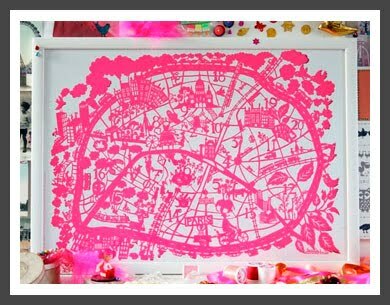 This one is a stylized map of Paris, with all of its arrondissements and familiar places; on my wish list, of course. 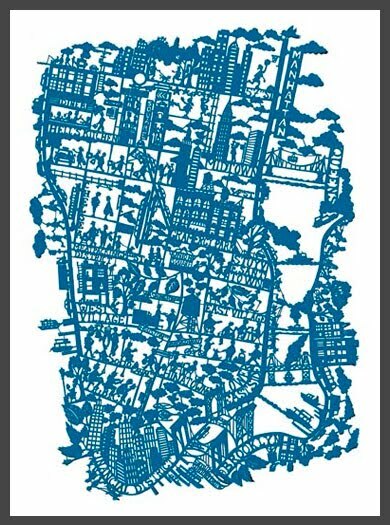 There's also one created for New York City, another of my favorite cities, and for London, and they all have such attention to detail and whimsy. For insight as to how these cut-outs are created visit the Famille Summerbelle blog for a short video of the process. You'll surely be shaking your head in awe as I was. i just saw the video today. amazing!